Physical Description: These Centipedes grow to 2 - 6 inches long. They are reddish-brown, have a flattened body and many legs. The number of legs a centipede has is dependent on the species and age. 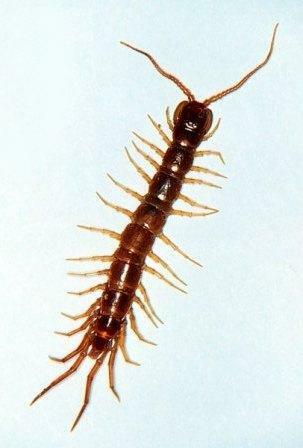 Fully grown Centipedes have 30 legs (15 pair). If there are less, it's because it's not an adult. Feeding characteristics: Centipede are voracious predators of other insects and play a beneficial role in the garden. Controls: Centipedes are predators and play a beneficial role in the garden. Their activities should be encouraged in the organic garden.